A SOLUTION to the eurozone crisis is staring European leaders in the face. Remarkably, they have failed to consider gold as the asset of last resort. Eurozone member nations and the European Financial Stability Facility (EFSF), the bailout fund, could use gold to back new bond issues. Gold-backed bonds would buy the eurozone time. Moreover, the application of gold backing would allow stricken nations such as Greece, Portugal, Spain and Ireland to depart from the restrictive eurozone and the accompanying depressive austerity policies, if they wished. The bonds would give them time to devalue, adjust and grow again, and also isolate the crisis contagion virus from other European nations. How would such a policy work? 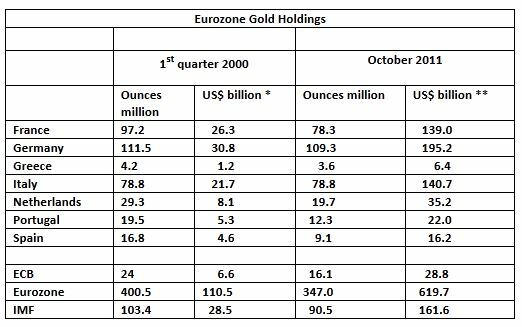 As at the end of October, eurozone nation central banks owned 347 million ounces of gold worth US$620 billion. This compares with 400.5 million ounces, then worth only US$110.5 billion, in the first quarter of 2000. The gold reserves fell because European central banks subsequently sold gold at knockdown prices of US$250 to US$350 an ounce after the Sept 11, 2001 terror attacks on the United States.Since then, the European finance minister and central bank lemming instinct has once again prevailed as their gold sales have dried up, despite recent record prices of US$1,800 to US$1,900 an ounce. Fortunately for eurozone leaders and their advisers, there is still a lot of gold left in the kitty. The current market value of the eurozone’s 347 million ounces has surged to US$620 billion or 453 billion euros (S$797 billion) – more than the current capital of the EFSF. There is no need to sell gold. Indeed, a major tool to combat the eurozone crisis has been ignored. Italy, a major gold holder, should issue gold-backed bonds.As can be seen from the table, Italy has been one of the very few sensible European nations not to have dumped its gold. It has remained at 78.8 million ounces during the past decade and is worth US$141 billion or 103 billion euros at current market prices. Assuming a conservative price of US$1,000 or 731 euro an ounce, the value of Italy’s gold would be worth 58 billion euros. This is still a sizeable chunk of backing for fearful global investors. Eurozone leaders have devised several complicated partial loss guarantee schemes to persuade China and other potential investors to invest in EFSF bonds. Hardly surprising, the response has been: ‘Thanks, but no thanks.’ On the other hand, if EFSF bond issues had the backing of gold plus interest, it would be surprising if European and international investors didn’t snap them up. Depending on demand, gold backing could be 25 per cent to 50 per cent of the total value of an Italian bond, for example. Take some precedents. In 1981 and 1982, South Africa, which was then the world’s largest gold producer, swapped nearly five million ounces of gold collateral in return for foreign exchange. In the late 1970s and early 1980s, indebted nations such as Brazil, Uruguay and Portugal either swapped or sold their gold to raise funds. In 1973, France issued ‘Giscard’ bonds, indexed to the price of gold. The International Monetary Fund (IMF) could also make better use of its 90.5 million ounces of gold worth US$291 billion. The United States, which has also hardly touched its bullion hoard worth US$468 billion, could play its part in combating the European financial crisis. The IMF has made several blunders relating to gold. Between 1978 and 1989, it sold 25 million ounces at an average price of US$228 an ounce and more recently sold around 13 million ounces, also at prices well below current market values. 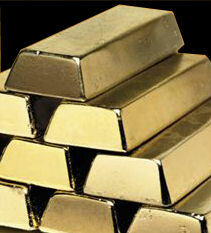 Instead of selling its gold, the IMF could use the bullion as collateral to borrow funds in global capital markets. Funds raised could be re-lent to Greece and other stricken nations which could default, leave the eurozone and devalue. The money, alongside foreign takeovers, could end a run on Greek banks. Moreover, IMF gold-backed bond issues would help replenish the Fund’s resources. There would be no need for the institution to beg for money from reluctant members such as the US, the UK and emerging nations. Some central bankers fear that the IMF will relax its loan conditions on debtor nations such as Greece. Whether the IMF borrows or not, monetary gold can be used in another way. A new institution could be formed to harmonise international lending and reduce market uncertainty. Leading gold holders such as the US, Germany, France, China, Switzerland, Russia, Japan, India and the European Central Bank, which hold the bulk of the world’s 988 million ounces currently worth almost US$1.8 trillion, could allocate a proportion to form the crisis institution. This new fund could issue gold-backed bonds to European and other nations as bridging finance whenever there is a threat of default. Indeed, when the IMF came into being some 65 years ago, member dues included gold payments. It was then envisaged that gold transactions would play an important role in settling international payments. That policy was put on the back burner in subsequent years, mainly because the US and others attempted to demonetise gold. Some might fear inflationary consequences if gold assets are used to increase international liquidity. They might also complain that good money is being thrown after bad. This isn’t necessarily so. For a start, the US Federal Reserve Bank and the ECB have already pumped money into the system since the crisis of 2008. If gold is used to borrow money from China and others to alleviate pain, the eurozone, bond and equity markets and eventually economies would recover. That would be better news for all.